This is the second part of a story about a spouse with Rheumatoid Arthritis. In Living with a Spouse with Chronic Illness, part 1, Michael described the surprising process of learning to recognize the amount of chronic pain that Rheumatoid Arthritis brought his wife Deborah. He explained that it was difficult to accept that his spouse suffered from Rheumatoid Arthritis because she did not look sick. In part two, Michael gives helpful words to spouses of Rheumatoid Arthritis patients taken from his own experience with Deb. These are things that he wished he understood sooner. I hope we will be able to share this story with many other spouses of patients or other family members. There is an email this post button at the bottom of the page. Our lives changed dramatically from being spontaneous to continually making trade-offs like, if we do this then we can’t do that. If we could go for a walk, she wouldn’t have energy to go to dinner or a movie. Just the simple act of myself or others greeting Deborah as we often do with a, “Hey Deb, how are you?” could open a Pandora’s Box of reactions. I could barely comprehend it. Eventually she boiled her response down to a simple, “I’m fine.” But those of us who really knew her understood. “Fine” meant she’s dealing with unbearable pain, but she’s still at church, with the kids, running errands, outdoors at a park, and it’s tough. Because she looked “fine” on the outside friends would try to be spontaneous and invite us to dinner, gatherings, parties or visits. They would ask if she could take care of their kids for an afternoon, or perform other acts of service when, for Deborah, just getting through the day was enough of a challenge. We adjusted much of our marital life as well with me taking on much more of the daily household responsibilities and limiting our intimacy as a couple. RA was the disease that changed the entire dynamic of our family and we slowly learned how to work and accommodate. This is a key point for those affected by RA directly or as a loved one. Your lives will change. Though you may not see the ailment, its effects are as real and as life-changing as someone having another severe illness, loss of limb, a permanent handicap or some other daily medical challenge. The pain is chronic and there is no cure. Some days are better than others as the pain arrives in waves and often, on the low-pain days, Deborah would be almost back to her old self again. But flare-ups would regularly happen and drag her back down again, sometimes for weeks. A word about flare-ups too – for those of us who love the sufferer – when they are doing “better” we may think they have finally been cured and the RA is gone. This will play with your mental stability, because the flare-up can pull them down to even worse than they were before. On some occasions Deborah’s flare-ups were so severe that she would be bed-ridden for days. As challenging as RA can be, you will still find days full of joy, laughter, fun and love. Yes, the pain is constant, but you and your loved ones can work together to manage it. Talking regularly about your pain levels openly, to validate what is happening and without desperation will help the rest of us come to an understanding of how you are suffering. Remember that to the rest of us you “look” wonderfully healthy, even glowing at times. We need reminders, yes – even long-time husbands like me – that you’re in pain. We want to connect with you, help you to not feel alone in this battle and show our love through understanding things that are unknown except to the sufferer. Deb tried every possible remedy – dietary changes, environmental therapy, exercise, acupuncture, massage, water therapy, naturopathic treatments, hypnosis, Enbrel and all sorts of other medications – all of them to little avail. She succumbed to many of the side effects that are “only suffered by a small percentage of the population.” Eventually the endless doctors and visits and tests became so burdensome and she simply gave up all attempts for relief. Deborah passed away from breast cancer in 2008. She and I believed that her RA pain masked what she might have noticed otherwise. A 5 cm tumor is considered very large and dangerous. 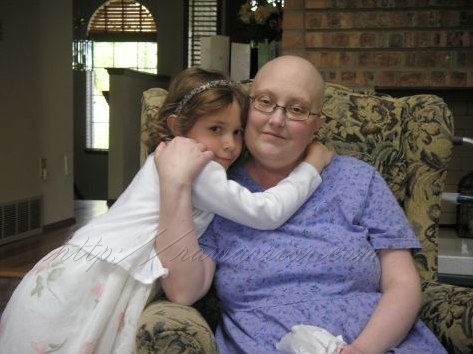 Deb’s tumor was 10 cm by the time she was diagnosed. Thank you to Michael for the courage to tell Deb’s story here. He told me that the ways RA affected their life became clearer afterward. He wished he understood better in the beginning. I have no doubt that Michael’s telling of Deb’s story will help other spouses of Rheumatoid Arthritis patients to grasp more of our experience of living with RA . Link to Michael’s blog. Lots more posts for those who do not have Rheumatoid Arthritis. Great blog. My wife and I are both blessed with auto-immune diseases. She has severe crohn’s disease. 4 surgeries in 5 years. Michael, thank you for sharing your experience. Thank you for supporting your wife so loyally and lovingly. And thank you for reminding us of the impact RA has on those we love. I am guilty sometimes of being consumed by its impact on my own well-being that I don’t consider how my husband or kids worry or feel. And I don’t want to burden them with my inability to do things I once could, so I, like your wife did, often say I’m “fine” when I’m not instead of unleashing a list of complaints. You have given us a beautiful example of devotion and compassion. Thanks for sharing! I’ll be praying for your family as you continue to adjust to life without her presence. Good words, Jodi. I hope that Michael’s message helps some families to discuss these things. Michael thank you so much for sharing yours and Deborah’s story. I’m so sorry that she was taken from you but she was certainly blessed with a caring, understanding & thoughful man in her life. I too am blessed with such a husband, although I know that sometimes he finds it very hard to understand how I truly feel, he is always there for me. I hope that others can learn from your story & can go on to be the kind of support that Deborah was lucky enough to have in you. You’re in my thoughts and prayers. Gilly. if I could say one thing to Michael, it would be God bless you for your faithfulness not only is his spouse but for carrying on such an amazing legacy and ministering to those who are currently dealing with chronic illness in their life and in their marriage. By sharing your experiences and your love for your wife, you have done her a great deal of honor not only while she was still alive but after her passing. As I was reading I was thinking of the many ways my husband honors me in small ways each day. I have lived with rheumatoid arthritis for 18 years since the age of 24. Were married two years after my diagnosis and have been dating for five years. Like a typical couple, their times when I wish you would do “just a bit more” like move dishes from this into the dishwasher. But I have to constantly remind myself of how very blessed I am that he does 10 times more than the average spouse. It sounds like you are one of those gems as well. and then when I got into the article and read that your wife had passed of cancer, I felt like someone had punched me in the gut. how terribly sad for your family and also just unfair! I don’t know if you realize that I have a Christian ministry for people who live with chronic illness called Rest Ministries, and although I can say that God is faithful and God is good there so much suffering that happens every day in each person’s life –I have no explanation for it other than to throw my hands in surrender and continue to assume that God has it under control and a purpose for the pain. But I read stories such as your own a long to have just a glimpse of his purpose.. Even recently, I asked my rheumatologists if my blood tests I have on a regular basis and that are pretty in depth due to all the medications I’m taking, which show if I ever had the beginning stages of cancer. And she simply said, no. It seems that so much of our body is being tracked through lab work but that should at least be a perk that we get. And what many people do not realize is that those of us who live with chronic pain each day and have very limited mobility in our hands, shoulders, elbows, etc., things like a simple, regular breast exams may actually be physically impossible. I have clicked over to your blog and look forward to reading it.my husband is a musician and I do a lot of Internet marketing set there is some overlap I look forward to checking out on your website. And let me just tell you when I saw the word in your description as “husband” I thought “how sweet.” He will forever be a husband. Thank you for sharing what I know is a very difficult situation and opening up your own vulnerability and being authentic so that both men and women dealing with this situation can benefit from your experience and even the joy that can still hearing your written voice. Michael, I echo what everyone else has said. I’ve dealt with autoimmune issues 25 of our 29 year marriage. From atypical Crohns disease to vasculitis causing GI dysfunction to Mixed Connective Tissue Disease, to FINALLY being diagnosed with RA-which all these previous illnesses were all related to- it has been a very long journey. My husband’s perspective is something I try to imagine, without much success, until I read your honest and poignant story. I’m so sorry you lost your dear girl but I’m sure you made every day, the best it could be for her. I pray you have been able to move on with your life. And again, thank you , for revisiting what had to be a terrible time in your life, to help others by talking about your journey. Michael thank you for sharing your time with Deborah and the influence RA had on your lives. Suffering RA isn’t a bed of roses, but neither is it for the person we share our lives with. Often we forget about how they feel in all of this. I’m lucky to have a supportive hubby who I love and worship. Thank you so much for bringing this to our attention. I’ll sit down and chat things through with my hubby more often and quit the ‘I’m fine’ act all the time. Michael, I applaud your courage and strength to raise your voice for awareness. I am crying and all I can think is, what a beautiful loving memorium your story is. Thank you so much for sharing. Thank you for loving your wife and striving to understand and empathize. You are an inspiration. God bless you. Thank you for sharing Michael. May Deborah rest in peace. Michael, I’m adding to the others about how courageous it was for you to share your compelling story. The last paragraph was chilling and raised a red flag–those of us with a chronic illness really need to be aware of any changes in our bodies and get those changes checked out immediately. Thanks again, Michael, and I’m glad to be your twitter friend. Give your kids a hug for me! Thank you. My wife’s engagement with RA is new, and apparently mild, though one never knows. But as a chronic four decade sufferer from osteo, including many cleansing knee surgeries, one artificial hip, and perhaps a knee in the offing, she has had the constant pain of most of her body’s joints through a long professional career, and a busy life as wife, mother, and friend to many. I hope many spouses will read this deeply understanding story. Thank you for this post. I have been married to my wife for 7 years and while she has suffered with Lupus from the beginning our real adventure began about 5 years ago when they also diaganosed her with RA. I read this post and feel that Michael is reading my mind. At times I have experienced all the emotions with a lot of them starting with anger, for my wife, at the doctors, and sadly selfish anger. The part of the post that struck me was when he was talking about how spouses can tend to think everything is OK on the good days and think it is all over and then comes a flare up. I do that everytime and each time it happens it is like she has just been diagnosed for the first time and I have to go through all the emotions again. Jesus has been my counselor in helping me deal with those emotions and I truly feel it is him that sends me posts like this one to show me that I am not alone. Hi Kevin. Ya’ll are not alone at all. Please know that. I guess it must be disappointing when flares make her condition change. I agree it is hard to comprehend. Mine doesn’t do that, but I hear about it a lot. How blessed is your wife that you would read this blog & think about ways to relate to her & make your family stronger. We have been living with RA since ’99. I am the one with the disease, my husband is my hero. I cannot believe I have lived this long without support. I am on my knees (metaphorically not physically lol) thanking God for this website. Your article Michael help give me the words to talk to my husband Dan. God Bless you and this entire community of Warriors. God bless you too, Kathy. I’m glad we could be here for you and Dan, too. Yes it is hard w/out support. Have you looked for local support? There is a page on the menu that lists a few groups. We are adding more to the list all the time. I’m sorry for your loss. Such an inadequate expression. My husband is a brave man who has been diagnosed with fibromyalgia for 20 years, and we now believe the fibro masked the RA for some time. RA attacked with a ‘flare’ 5 months ago, and is now our daily partner. Ken’s responses to “how are you?” range from “not too bad” to “so-so” to “I’m doing ok”… not a good or fine in the lot! The pain he endures sends me crying to sleep a lot of nights. I want to rail and scream “when is enough enough?” but when I read the many, many stories of courage on RAWarrior, I realize that we aren’t fighting this alone. Thank God for this resource. One of the pains that Ken endures, too, is of looking ok. Once you see him move, most days, you would know he’s in obvious pain, but he retains that guilt of “appearance” plus that of not being able to support us. Grief and guilt, when his energy is needed to deal with simply being. His body has betrayed him in almost every way. I am 41 years old with 3 children aged 7, 9 and 19, and have had RA for just over 7 years now. Unfortunately, my husband could not cope with the changes this disease brought to our 10-year relationship. He often implied that I should be capable of doing more housework and how burdened he was by my illness. It did not come into the equation that I suffered every day, felt very ill and that even the smallest tasks took a tremendous amount of effort and will power. In the end, the RA was the main reason our relationship was not able to survive, as my husband would not accept that the RA was a reality. Having said that, Michael I wish I had had a loving husband like you. Your wife was very blessed. You tried so hard to support your wife and I am sure she appreciated it very much. It takes a lot more strength to walk side by side through difficult times. I am truly saddened that you lost your wife to cancer in the end. I have to confess that I cried when I read your 2 posts. I hope to God that your family has been able to carry on with life as your wife would have wished for. Grieving like that is a very lengthy process and I suppose you never get rid of the wound, but you learn to live with it.